We're proud to release this new feature you won't find in a competing application – you can now create a booking series with a custom repeat pattern. Imagine being able to select independent booking dates to create a booking series, and being able to modify and add any date within a recurring series without breaking the repeat pattern. These customizable repeat patterns can be set for up to a year, and the system will alert your staff when there are conflicts for any of the dates in your series. Events can now be broken down by family members on receipts. 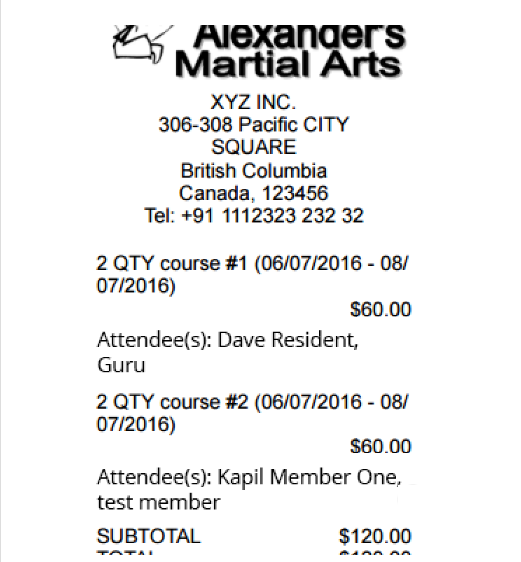 If the receipt includes event items, the attendees associated with the course will now appear on the receipt below their associated event. With a big family, it can be hard for parents to keep track of which family members are taking which courses. Dad now knows John signed up for karate class and Jill is taking taekwondo. When searching for contacts, you may or may not want former students to appear in the search results. Under General Settings, enable or disable the system from displaying former members in search results. template means that you can ensure that even your email messages are consistent with your business branding. For multi-location schools, each location can have its own customized message. Your instructors are currently being paid a percentage of course revenue based on actual fees paid by your students. Now, you can generate payment reports and pay your instructors based on custom revenue calculations, such as your students paying the lowest possible fee. Let's say your dojo school offers discounts for students who are within a certain residential zone. With a multi-tiered pricing structure, some students pay a higher fee than others, but you wish to pay your instructors a flat fee for each class. With this new feature, your staff payment reports can be based on revenue calculations where each of your students paid the lowest fee, such as a residential fee. Access all of the calendar functionality that was on the browser version of PerfectMind, as a Smart Client user. Whether or not your staff is logging into the system from a web browser or the PerfectMind application, they can create detailed custom reports on events and activities using Calendar Event. Questionnaires are useful for collecting information about your students and grouping them based on their responses. This new report lets you set filters based on the type of question asked, and their responses to the questions. This can be particularly useful when asking your students questions about demographics or even belt rank, and using their responses to help you better tailor your marketing efforts or membership packages. You can now email calendar schedules to your members as a PDF attachment. The schedule will be sent to the primary email address associated with the account. When requesting a digital signature, the body of the digital signature request email is customizable for Send to Sign under Website Setting.